We are looking forward to celebrating 25+ years of creative theatre-making with all of you at the new Arts Trust Building at 33 Hawley St, Northampton (just down the road from Spoletos restaurant). Many of you have signed up and there is still time to be on the list. SO phone Sheryl at 413-588-7439, and if you don't get her on the line, leave a message that you are coming. Each alum and one guest will be welcomed at the side door of the Arts Trust building just off the free parking lot. Everything is free but there may need to be a cash bar with beer, wine, and sparkling water. Food is being prepared by many friends of Serious Play. If you wish to bring a special dip or snack- go for it. 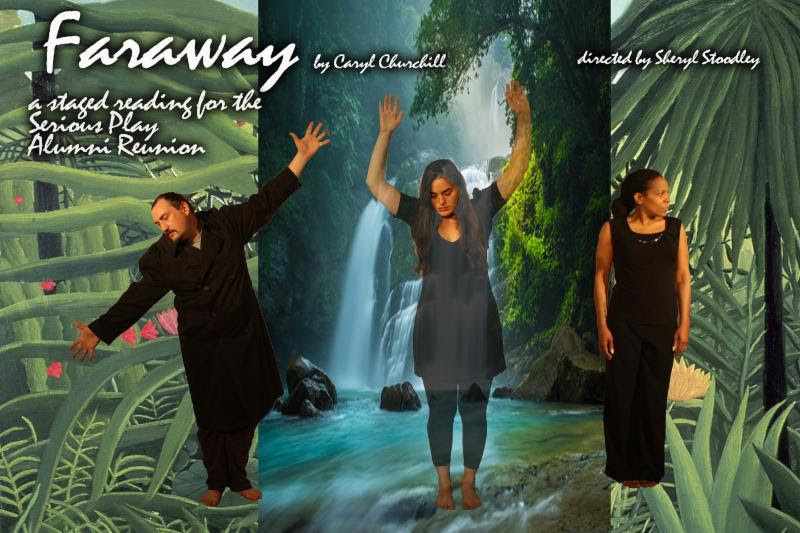 All arrive at 33 Hawley St by 7:45pm for an 8pm alumni staged reading of Caryl Churchill's strange and unsettling play FARAWAY. I have become so interested in Churchill's work. We will be in an 80 audience air conditioned room, since the upstairs theatre is not as yet complete. There will be alumni, collaborating artists, and invited guests. We are dedicating the Serious Play Alumni Reunion to the memory of ensemble alum Dane Botfield, who we lost this past year. We will be welcoming with open arms Belinda Botfield (Dane's wife) to our celebration. Immediately following the staged reading, we will open up the room to enjoy an informal party where we can talk, relax, and catch up with one another. Do not dress up. NOTE- As part of the Staged Reading there will be an "Alumni Procession" of 15 Alumni. These alumni will be receiving an e-mail soon with specific "procession" details as to all black clothing, and a quick rehearsal during the day at 33 Hawley. It is a movement procession with no speaking, simple and important. From noon to 4pm on Sunday, those who can are welcome to come over to 126 Main St (the APE Gallery) where we will continue our reconnections and share new work of alumni. Bring your coffee and join us! SIGN UP NOW by calling Sheryl at 413-588-7439, there is still time! SEE YOU ALL SOON on June 30 for an extraordinary Serious Play Reunion.